I ordered this dress in the coral paisley in a size Large. I'm 5' 4" and about 160 and carry my weight around the middle. The large fit but a bit more snug through the belly. I returned for an XL and ordered it in 2 colors, coral & navy paisley. I love this dress. The fabric is beautiful and the style and design details were high end. I suggest you try it. I think it's a winner. I don't wear a lot of dresses so I was hesitant to buy this. I am so happy I did. 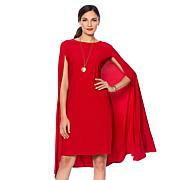 This dress is so figure flattering and just glides over your body. The weight of the fabric hides any figure flaws. You can dress it up with jewelry or down with a little cardigan or jean jacket. I usually wear XS which is what I ordered. Although I am only 5'1", the length is no problem. You will not be disappointed in this dress. I bought the navy print and I'm thinking of buying another in the solid colour. The teal color is great, got the matching scarf too. Love the lengthcovers the knees front and back and I am 5 foot 8. The bias cut is beautiful, but could have more room in the hips, which is why only 4 stars. Not a dealbreaker though, still a great buy. I DO like the knit fabric, nice weight and drape. Beautiful dress, I loved this dress material, I ordered my correct dress size, but it was extra tight from the bust down to my waist. I prefer not going up a size cause the overall fit would be to large. I had to send it back. Great style. Very fluttering to figure. True to size ( M). But so cheap material. I would definitely paid double if CURATOR could replicate that really designer's cut in a better fabric.